Pylon is a novel by the American author William Faulkner. 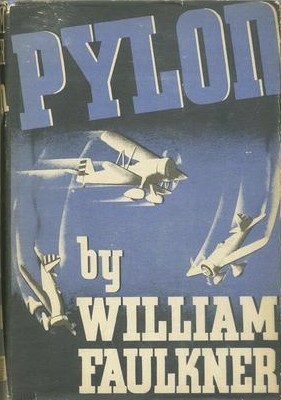 Published in 1935, Pylon is set in New Valois, a fictionalized version of New Orleans. It is one of Faulkner's few novels set outside Yoknapatawpha County, his favorite fictional setting, based on Lafayette County, Mississippi. Pylon is the story of a group of barnstormers whose lives are thoroughly unconventional. They live hand-to-mouth, always just a step or two ahead of destitution, and their interpersonal relationships are unorthodox and shocking by the standards of their society and times. They meet an overwrought and extremely emotional newspaperman in New Valois, who gets deeply involved with them, with tragic consequences. While most critics consider Pylon to be Faulkner's most flawed novel ("unnecessary horror and violence," "unintelligible descriptive passages," an "inconceivable climax"), Faulkner himself is reported to have considered "The Tarnished Angels" (1957) the best screen adaptation of his work. This may have been because director Douglas Sirk was interested in making a movie emphasizing returning World War II soldiers who were completely at a loss, drifting rootlessly without a home, without genealogy.